The customer was keen to replace the system with a product that would eliminate these issues from their system and offer improved longevity, operability and performance. 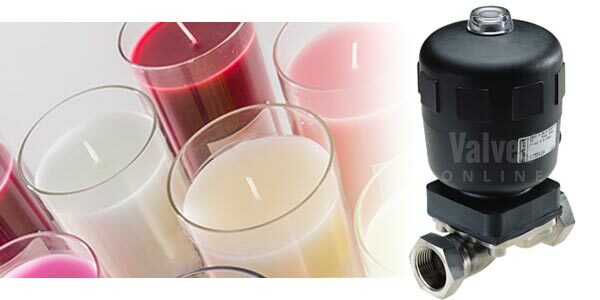 Using a solenoid valve was not really an option thanks to the flows required, the temperature, chemical compatibility, and physical properties of the media. The candle wax consisted of a paraffin base which was not compatible with EPDM and the colourants and scents that were to be used with it meant that NBR would also not be suitable, leaving us with the options of PTFE or FKM for widely available seal materials. To allow it to flow the way required trace heating on the pipelines and valves and further components, however when the factory was shutdown overnight and weekends the way would solidify in the line and valve often blocking the small orifices and flow paths in the solenoids that had been used over the years. After consultation with the customer it was agreed that a pneumatically operated valve would provide them with the speed of response required by the process, by using the pneumatic valves coupled with a pilot solenoid valve the existing control system could be utilised requiring no reprogramming of the PLC or large scale rewiring effort. The self-draining design (when installed as per recommendations) also meant that the clogging issue was largely removed. Stainless Steel Body Construction meant that the corrosion from the chemicals used for the colouring and scent was eliminated. This had the knock-on effect of removing discolouration from the end product and reducing the volume of colourant required, reducing process costs. The self-draining design coupled with the operation of a diaphragm did not result in the removal of heating the valve to prevent solidification however it did reduce the amount required thanks to the amount of body material. 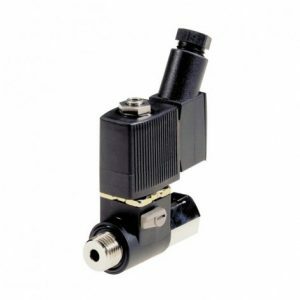 We combined the Type 2031 with the Type 6012P Banjo mount solenoid valve. 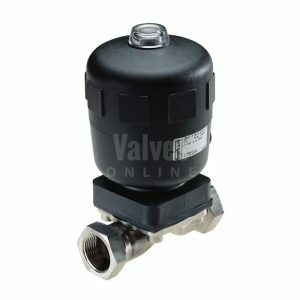 The solenoid mounts directly to the Type 2031, and makes use of a 6mm Push-fit Pneumatic Connection making fa a very compact valve in comparison to offer technologies such as Ball Valves or Pinch Valves. As a further note the use of the diaphragm valves has enabled the customer to look at removing the electric line heating and is now looking at making use of jacketed pipework and heating pots on the valves to make use of a steam/hotwater line heating system them with the aim of reducing the electricity bill and making use of the existing steam capacity that is currently going to waste i.e condensate/flash steam recovery.